With the Santos Tour Down Under under in town again we see an increase in the number of people cycling on our streets. Cycling is a great way to keep fit and get where you want to go. It is often considered an excellent fitness activity for it’s low impact. Whilst cycling is a low impact sport it is not the most forgiving for other parts of the body. 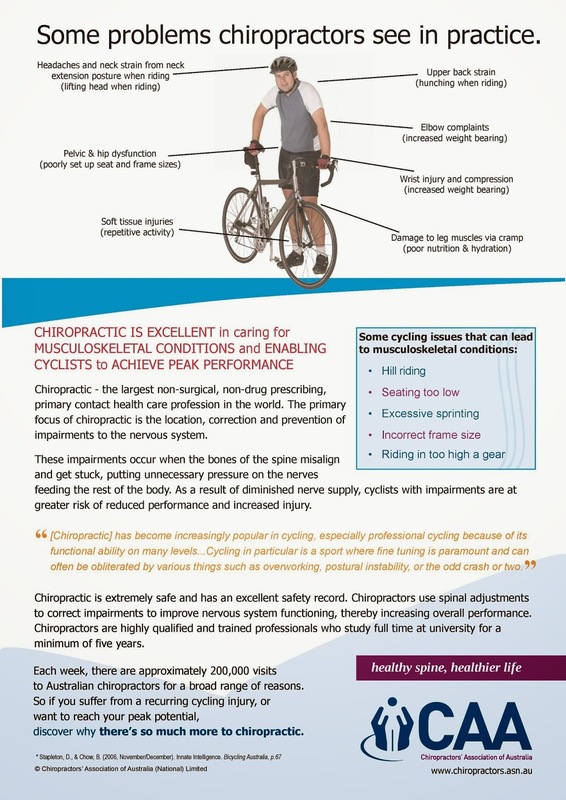 Below is an image from the Chiropractic Association of Australia (CAA) which shows some of the common issues that can result from cycling. Many of these issues are a result of incorrect bike size or setup. Others are due to poor riding technique, while others are due to exerting too much or too fast. These conditions are regular reasons see chiropractors, osteopaths (and physiotherapy and acupuncture). If you are feeling any of these issues, we may be able to help. Chiropractic, Physiotherapy, Acupuncture and Massage are all ways to help prepare your body for strenuous exercise by ensuring that your muscle groups are working in the best way possible. Silent problems, such as sprains and pain caused by tight muscles, are a result of poor posture and static or repetitive work postures and repetitive tasks. Some call these relatively small problems, but they can really ruin a great riding day, and miss that personal best! If you are taking part in the Santos Tour Down Under’s challenge rides you will need to make sure you are up to the task. Ensure that your body is prepared both in training and in nutrition. Consulting CoreNutrition’s Accredited Practicing Dietitians here at Be Smart Get Supple can give you a boost in your performance, by learning how to use your food to correctly fuel your body for the task. Dropping a few kilo’s that might have snuck on over the festive season, will help reduce the risk for many of the problems shown in the above image also. A little known influence on cycling performance is the function of the foot. Poor foot alignment can cause a change of knee angle. This will either reduce the power from each push and increasing wear on the hips and knees. The Physio at Be Smart Get Supple has had experience with correcting foot issues and reducing pain from cycling. The other benefit of going into an event like this physically well prepared, means you are better able to mentally deal with the task, which allows you to reach your goal easier, even if that goal is just to reach the finish line in one piece! Better preparation also means better recovery, so you can enjoy more of life. So if you are thinking of dusting off the treadlyl or trying to smash your personal best call us at Be Smart Get Supple for a physical check up to get the most out of your cycling joy. PS. If anything does happen to go wrong we can help you get back enjoying your favourite sport more effectively also.